(Phys.org) —A team of researchers working at Northwestern University has found that tin selenide (SnSe) has the highest Carnot efficiency for a thermoelectric cycle ever found, making it potentially a possible material for use in generating electricity from waste heat. In their paper published in the journal Nature, the team describes work they've conducted on SnSe and how their discovery might lead to even more efficient materials. Joseph Heremans gives a short history of thermoelectric research in a News & Views companion piece and offers some insights into why SnSe might be so efficient and how it might lead the way to the discovery of even better materials. As the planet continues to experience the impact of global warming, scientists around the world frantically pursue alternate ways to produce electricity—one such possibility is to convert waste heat from industrial process into electricity. To make that happen, a thermoelectric generator must be constructed and used. Such generators operate by taking advantage of differences in temperature experienced by a single material. 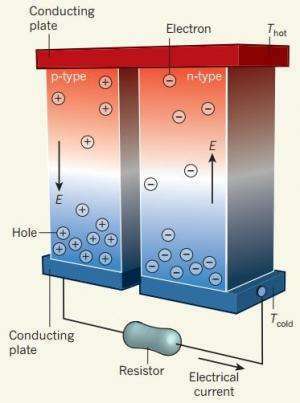 Two thermoelectric semiconductors are exposed to a temperature gradient and are connected together by conducting plates. Thus far, however, the process has not proved to be efficient enough to warrant the expense of building and using such generators, despite doubling in efficiency over just the past fifteen years—from zT 1 to 2. The increase in efficiency has been due mostly to research work involving nanotechnology, and the materials used have generally been based on lead telluride. The difficulty in finding better materials has been stymied by the dual properties required: low thermal conductivity and high electrical conduction. SnSe has been used by scientists for a variety of purposes, but due to its stiff bonds and distorted lattice was not really considered as a possibility. But that was because others had not taken into account the compound's low anharmonicity. When the team at Northwestern tested it as a possible material for use in a thermoelectric generator they found it had the highest zT ever found, 2.6. 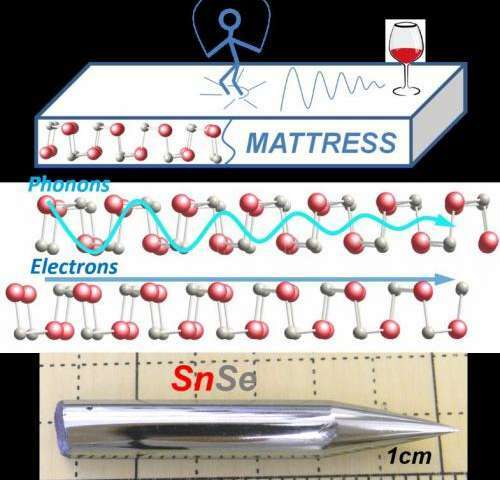 The increase in efficiency is clearly welcome, but is still not enough to revolutionize the field—what might would be the discovery of another material with an even higher efficiency—something that might be similar to SnSe. The thermoelectric effect enables direct and reversible conversion between thermal and electrical energy, and provides a viable route for power generation from waste heat. The efficiency of thermoelectric materials is dictated by the dimensionless figure of merit, ZT (where Z is the figure of merit and T is absolute temperature), which governs the Carnot efficiency for heat conversion. Enhancements above the generally high threshold value of 2.5 have important implications for commercial deployment1, 2, especially for compounds free of Pb and Te. Here we report an unprecedented ZT of 2.6 ± 0.3 at 923 K, realized in SnSe single crystals measured along the b axis of the room-temperature orthorhombic unit cell. This material also shows a high ZT of 2.3 ± 0.3 along the c axis but a significantly reduced ZT of 0.8 ± 0.2 along the a axis. We attribute the remarkably high ZT along the b axis to the intrinsically ultralow lattice thermal conductivity in SnSe. The layered structure of SnSe derives from a distorted rock-salt structure, and features anomalously high Grüneisen parameters, which reflect the anharmonic and anisotropic bonding. We attribute the exceptionally low lattice thermal conductivity (0.23 ± 0.03 W m−1 K−1 at 973 K) in SnSe to the anharmonicity. These findings highlight alternative strategies to nanostructuring for achieving high thermoelectric performance. How does this compare with that article about the zinc oxide nanowire/aerogel discovery a few days back? what... zT would be commercially viable? Looks like conventional Peltier element. Peltier is the opposite effect. I seem to remember that zT = 6 is the commercialization value. It seems to me that nano engineering to change the ratio of heat transport to electron transport is the way to go. This is an amazing material; SnSe. It thermally conducts in the crystal X and Y directions but insulates in the Z. Quantum mechanically it is strange breed. You have to love what nature creates and gives us.